I love these Storybook pails. With all of the wonderful vintage imagery available, you could really customize this look to reflect your favorite fairy tale. This may be my favorite project in the book. Ooooooh! It could be this one too! Can I pick two favorite projects? A sweet fairy captured fairy wand! Perfection!!! This June 17 marks the 11th anniversary of my Grandpa "Tom"'s death. It's funny when you are a kid, you imagine that your grandparents have been parked in front of the television watching Lawrence Welk since the dawn of time. My maternal grandparents moved to Arizona to settle near my parents in the late 70's. We used to have dinner (the kind you eat at 3pm) every Sunday at their house as far back as I remember. Always Grandpa was seated in the Harvest Gold upholstered wing chair with the t.v. on, and as my 5 year old self bopped on in to plant a kiss upon his papery cheek, he'd exclaim "Jeeennnieeee!!!" in that accent that Italian Grandpas from Brooklyn have. Nana kept their house spotless... plastic runners protecting the 70's shag carpets up and down the hall, plastic covers keeping the blue and green furniture safe from me, the one with the butterscotch candy sticky fingers. Religious artifacts made up most of the home's bric-a-brac, primarily Roman Catholic, but Nana also snuck in a few Budda statues. She used to tell me to rub the statue's bellies for luck. Oh, and there was always something amazing cooking in the kitchen on those Sundays. ..typically Italian, stuffed green peppers, lasagna, manicotti. Sometimes a beef roast with oven brown potatoes and a creamy cucumber salad... my favorite. Sadly, I remember both of these maternal grandparents as quiet, and dare I say, kind of grouchy/unhappy folks. But recently, a perusal of some old photos of them in their youth told me a different story. My mom was gracious enough to lend me her photo albums, and since I find the pictures to be so fascinatingly nostalgic and sweet, I thought I'd share come of them with you. The photo above was captioned "Coney Isaland 1938". My grandpa is the one on the left. Bathing suits with belts! The one above was also taken on Coney Island, but two years later, in 1940. Nana Cecilia is the beauty in the middle. Here she is again. Super cute! Grandpa and his friends goofing around circa 1940... Still wearing the belted suit I see... And here's a couple of photos of them all together. Looks like they were having so much fun. I wish I could have glimpsed some of that carefree happiness in their later years. A classic photo booth shot of my grandparents in the 30's. I love his tie. Grandpa served as Marine and was separated from his family for almost 5 years as he served in World war 2. He lost his brother Joey (pictured below with his girl) in that war. My mom is pictured between my Grandparents in the photo above dated 1953. She is the eldest of two girls. The final photo shows my Grandpa modeling in ad for an Airline company, silver haired and handsome still! It's funny how a perusal of an old photo album can give you new perspective on the people you thought you knew. Looking through these photos, I find myself wishing that I had taken the time to hear more of my grandparents' story (as I was fortunate enough to do with my paternal grandmother that I posted about here). If you are lucky enough to have your grandparents still around, I really encourage you to ask them to share their memories with you. If you are a grandparent, please take the time to share your story with your grand kids (with photos too!). What a gift that would be! One last stop on the 12 hour trip was at this antique store just off the beaten path . I purchased one of my favorite childhood books. More on that in a few days. In the meanwhile, go check out Spookytime Jingles! Lots of cool stuff on offer this month! 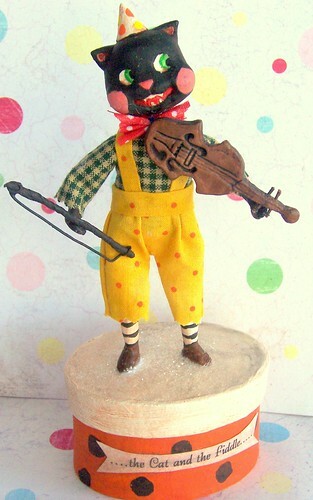 Another PFATT offering this month is a Mr. Cat with the Fiddle. A Halloween twist on the Nursery Rhyme classic, Cat n' Fiddle also has hands, head, hat and boots sculpted from paper clay. His clothing comes from my scrap stash and his bow and fiddle were painstakingly sculpted from paper clay and wire. Both Winifred and Cat will be available here on June 10. I am also excited to be the featured artist for the June 10 PFATT. 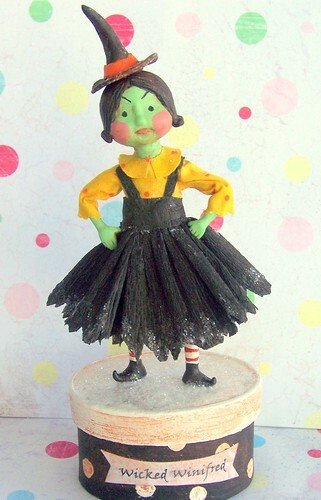 And last (but not least) this Ghoulish Gala of Halloween ornies will be proffered on SpookyTime Jingles this month. (One of those kitties will be offered as a giveaway). 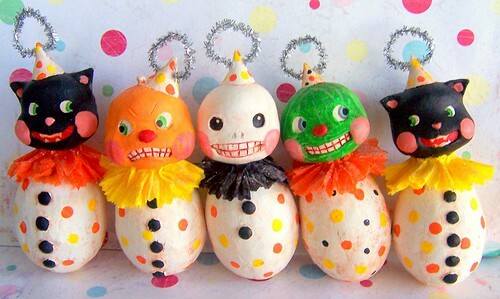 They are hand sculpted from paper clay over foam and re purposed Easter Eggs. These guys (along with a Wintertime friend) will be available here on June 13.